HH’s affordable Tessen range has been upgraded, and now represents even better value for money. As you may know, long-running PA and amplification brand HH now belong to the Midlands-based Headstock group of companies (which also includes Laney amplification). 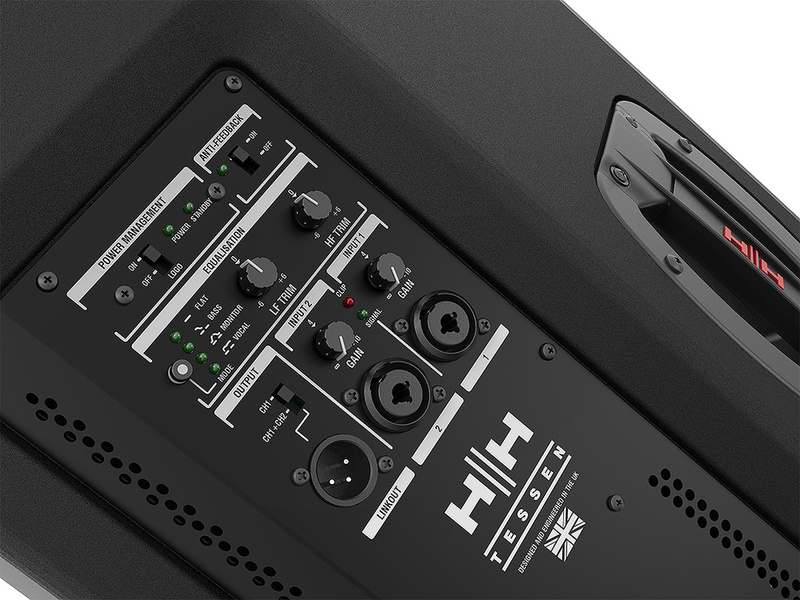 Our review of their original HH Tessen TNE 112A showed it to be a dependable, cost-effective workhorse for gigging musicians, but a radical overhaul of the design means that the new Tessen TNE-1201 now shares many of its attributes with the high-power TNX-series speakers. In the case of the TNE-1201, that means that onboard DSP is present to offer task-specific presets, EQ, overall system tuning, anti-feedback and basic two-channel mixing capabilities, as well as looking after crossover and protection duties — which includes limiting. An integrated anti-feedback system, when switched on, uses 12 very narrow-band filters that are deployed whenever a feedback frequency is detected. While the plywood casework is of a similar style to that of the earlier model, the drivers are new, with a high-sensitivity, long-throw HH12 Kevlar-cone woofer covering the lows and mids. This is an upgrade on the original but still sits below the Celestion-built drivers used in the TNX series. For the highs, an Italian-designed LaVoce one-inch compression driver feeds into a flared horn. A 1.5mm-thick perforated steel grille protects the drivers, and this is backed by a thin layer of foam to protect the drivers from dust and other debris. Power comes from an upgraded Class-D 1600W bi-amp pack running from a switch-mode power supply, which minimises both weight and heat dissipation. The amplifier pack is convection-cooled so no fan is required. The cabinet is fitted with three M10 flying points as well as a 35mm pole-mount socket in the base, though it is shaped to also double as a floor monitor sitting at a 35-degree angle. Recessed carry handles are fitted to the side of the case. Rubber feet are also fitted to the base for standing directly onto a surface, though these also protect the underside of the cabinet from scratches when you’re standing the speakers on the ground while loading them into the car. A tough black textured-paint finish is applied to the cabinets, which measure 570 x 360 x 350 mm and weigh 15.7kg. By way of specification, the speakers are designed to cover a frequency range of 47Hz to 20kHz and are capable of producing a maximum SPL of 129dB with a 70-degree symmetrical coverage angle. 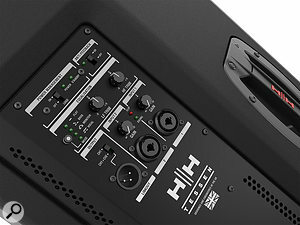 Adding one of the HH Tessen subs is an option for those needing higher levels of bass. The mixer section has two inputs on ‘combi’ balanced XLR/jack connectors, each with its own gain control but sharing a pair of signal-present and clip LEDs. These are designated as line inputs, but there’s enough gain range to use a dynamic microphone at a modest level. A link output jack can be switched to carry a mix of the two channels or just the output from channel 1. In the EQ section, there are four presets called Flat, Bass, Monitor and Vocal that can be stepped around by means of a single button. Additionally, there are separate rotary HF and LF trim controls, each with a ±6dB range. The DSP mixer section and EQ controls.At the top of the panel, the Logo switch simply gives you the choice of whether to have the HH badge illuminated or not. Two nearby LEDs indicate power and standby status. By default the speakers go into sleep mode after being idle for around 25 minutes, though this can be changed by the user if required. The anti-feedback section is either on or off, as it doesn’t allow filters to be locked during setting up. Its methodology is that feedback is suppressed once detected, but when it has stopped, the currently assigned filter is released to carry on looking for other trouble spots. To test the speakers, I first took them to a pub gig and set them to flat. Our singer generally needs a bit of top boost to help him cut through so I added a little HF on the mixer and also used the speaker EQ to lift the highs slightly (as we were also amplifying a cajon and guitars, I didn’t want to use the Vocal setting, which rolls off some low end). The end result was loud and clean with plenty of power in reserve. I was also generally impressed with the sound quality, which translated the detail of the acoustic guitar without sounding too aggressive. The anti-feedback system is helpful in killing annoying ringing or squeals when the singer moves the mic too close to a speaker, but I still prefer systems that allow you to lock some of the filters. If you’re using a standmounted mic, lockable filters allow you to tame the worst feedback frequencies during ‘ringing out’. As all of the 12 filters are left ‘mobile’ in this design, it is quite possible that feedback will return at the same frequency once it has been dealt with and the filter redeployed. The anti-feedback system will identify the problem and fix it again but in the meantime, you might hear the onset of feedback as the problem has to become audible before the anti-feedback system realises it needs to act. Nevertheless, having an anti-feedback system in such affordable speakers is a genuine bonus — and unlike some budget anti-feedback systems this one doesn’t change the subjective sound to any significant degree when it is active. When using the speakers as monitors the anti-feedback system can be particularly helpful. My second test was to use the speakers as floor monitors for a mainly acoustic band that included four violin players and a double bass. The Monitor EQ setting rolls off both the highs and lows to focus on the important mid-range, and worked perfectly well in this instance. As conventional ‘box’ speakers go, these are very effective and provide good audience coverage despite having a much narrower coverage angle than the mini line arrays I’ve reviewed in recent months. Both the specifications and the feature set have been upgraded significantly from the original Tessen 12-inch design, yet the cost is very reasonable. 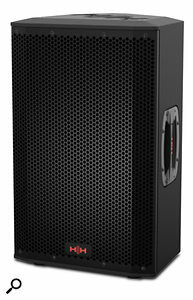 A pair of Tessen TNE-1201s make a very capable ‘mainly vocals’ PA for a gigging band and, with the addition of a sub, they make an impressively compact full-range system. They are light enough for one person to lift them onto their stands and small enough that I could get both speakers plus my guitar amp, three guitars, stands, pedalboard, mixer and so on into the back of my medium-sized hatchback without problem. Definitely a worthwhile upgrade on the original. This is a crowded end of the market, with competition coming from the likes of Mackie, Alto and LD Systems, to name just a few. Great sound quality for the price. Built-in mixer and anti-feedback processor. A very worthwhile upgrade to an already very competent speaker. The TNE-1201 is compact, affordable, has a bunch of very useful features — and sounds good too. £499 per speaker including VAT. £499 per speaker ($666 at time of going to press).